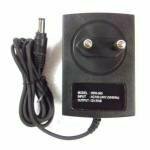 12 Volt 2 Amps DC Power Supply Adapter for CCTV Security Camera Tec..
12 volts Power Supply Power Adapter For RELIANCE BIG TV SET TOP BOX ..
12 volts Power Supply Power Adapter For SUN TV SET TOP BOX 100% .. Excellent Quality 12.0 Volt - 2.0 Amp DC SMPS Type Power Adapter. Exc..